Writing skills – For a technical writer, writing skills can never be overlooked. The technical writer still needs to write in a clear and concise manner and to be able to convey information appropriately for a variety of audiences. Technical skills – The technical skill set of a technical writer depends greatly on the subject matter, product or service that requires documentation. Hardware and software documentation differ in the skills that the technical writer needs to bring to the table. Additionally, pharmaceuticals and other manufacturing industries have specific requirements that translate into knowledge the technical writer must have. A technical writer asked to document a developer’s guide may need to have a pretty good handle on specific programming languages, while a technical writer tasked with documenting a weapons defense system might need a high degree of engineering comprehension as well as a solid knowledge of government documentation standards. Tools skills – Needless to say, a technical writer needs to know his or her way around computer systems, since they are used to produce documentation in a variety of formats. Specific tool knowledge, such as MS Word, MadCap Flare, RoboHelp, and even Atriculate and Captivate really depends on the tools the organization has come to rely on in order to produce its technical documentation. However, technical writers are accustomed to learning – it’s really what they do, and most are capable of learning a new tool quickly and efficiently. Interviewing and listening skills – Technical writers need to know how to ask questions. They also need to know who is the best person to approach and they need to have a feel for the varying personalities and preferences of the people – the subject matter experts, or SMEs – in order to know how best to approach them. Once the technical writer has found the appropriate SME to approach, strong listening skills will be required to capture the information necessary and to know which follow-up questions need to be answered. Design skills – An appreciation for the visual can be an important part of the skill set of a technical writer. Even the earliest technical documents didn’t consist of just the written word. To a growing extent the technical writer needs an appreciation for graphics and formatting as well as illustration skills. Depending on the needs of the organization, these skills may only need to be rudimentary or they may need to be very advanced. Usability and testing skills – A technical writer may also be asked to take an active role in usability and testing. Even if not asked to take a role, the technical writer knows that validation of the documentation is important – the confirmation that the product works the way it is documented to work. 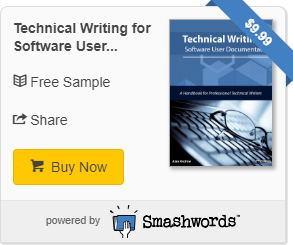 In some organizations, the technical writer is an important part of the User Experience team.